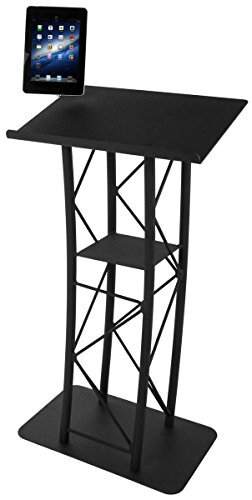 This truss podium is made from durable steel and aluminum, with a durable and sturdy base and 4 stand columns. The steel and aluminum trusses interwoven between the columns make this unit appear modernly sleek, but also provide durable support. The top surface measures 23" wide and features an ample, 1" lip for keeping contents securely in place. The top surface is also angled, for assistance with reading and speaking. Below the top surface is a shelf measuring 10.5"W x 10.5"L, to hold accessories and supplies. Included with this lectern is an iPad enclosure, which attaches to the top surface of the podium! This enclosure is compatible with iPad 2-4, iPad Air, and iPad Air 2 and mounts in place to provide reading or speaking notes. Overall dimensions: 23.5"W x 64"H x 19"D. Weight: 47.5 lbs. Features a top surface that is 23" wide, slanted/angled, and has a 1" lip to keep reading material in place. Includes an iPad holder that attaches to the podium. Compatible with iPad 2-4, iPad Air, and iPad Air 2.